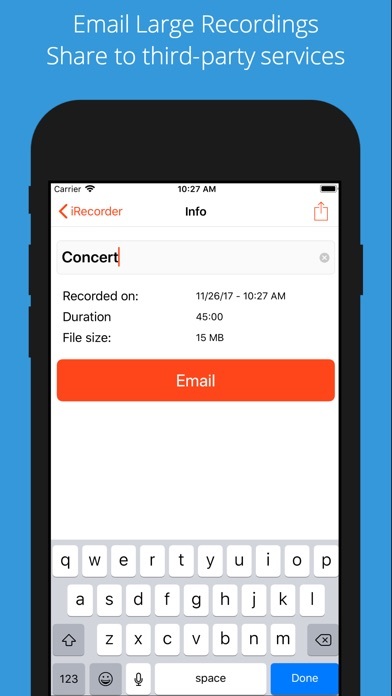 iRecorder Pro is a quick and easy to use audio recorder for iPhone and iPad, with Wi-Fi transfer to any computer. Customers LOVE iRecorder, you will TOO! SIMPLY THE BEST: iRecorder is designed to be quick and easy use, and simple to understand. Great for on-the-go capture of your thoughts, ideas, notes-to-self, lectures, concerts, music, you name it! Record for hours, or just seconds. * HIGH-QUALITY RECORDINGS * FAST LOAD TIME * EASY TO USE * EVERYTHING ONE TAP AWAY * USERS LOVE THIS APP, YOU WILL TOO! 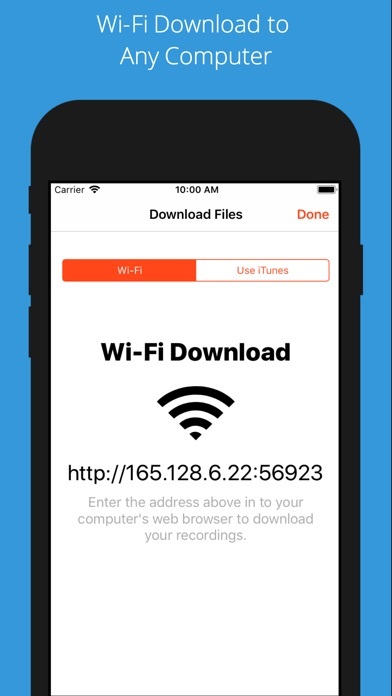 MORE GREAT FEATURES: * Wi-Fi Sync to transfer recordings to any computer on the same Wi-Fi network * iTunes file sharing * Share recordings using iOS share extensions * SmartSplit to easily send large recordings in multiple parts * Record in the background * Adjust playback speed * pause and resume during recording * no limit to recording length * rename and re-arrange recordings quickly * rotates upside down for easy microphone use * Use microphones, headsets etc. * VoiceOver optimized, VoiceOver on during recording SIMPLE BY DESIGN: When it comes to mobile applications, sometimes less is more. We kept iRecorder simple and un-cumbersome, leaving a great user experience. PRO QUALITY: Our recording quality is second to none. 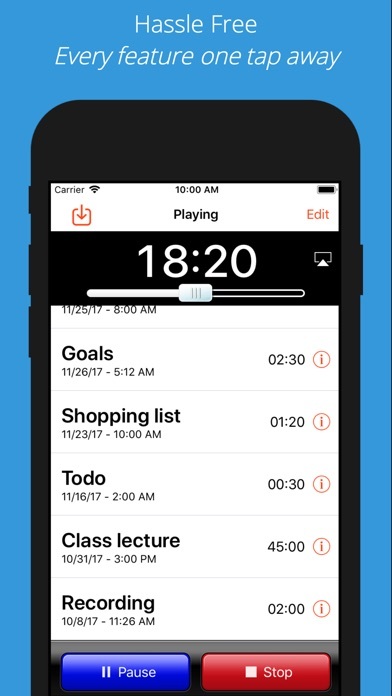 We deliver pro-quality recordings, and a high-quality​ user interface you would expect on iPhone. GREAT CUSTOMER SERVICE: Our customers praise us for great customer service. We take it to heart. If you have an issue we are here to help you. 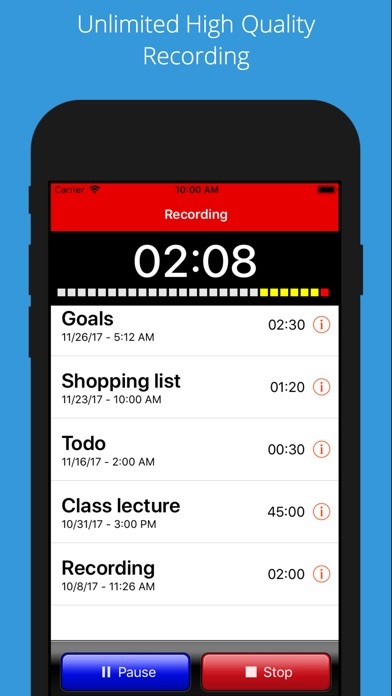 ACCESSIBILITY PROMISE: We are dedicated to making the best & most accessible recording app for iOS. 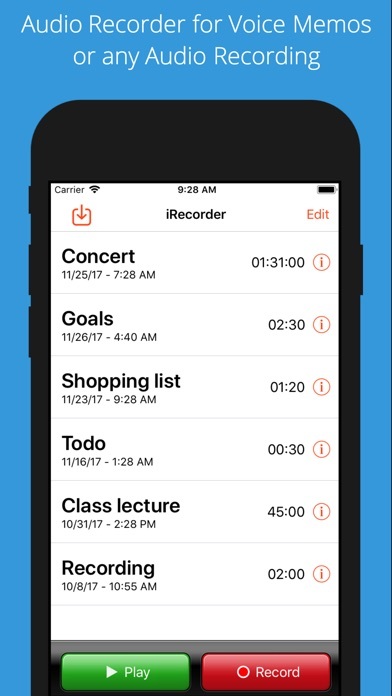 iRecorder is optimized for VoiceOver users! iRecorder is a trademark of SimpleTouch software, all rights reserved. I like to use iRecorder to record mantras and play them back while I practice yoga exercises.